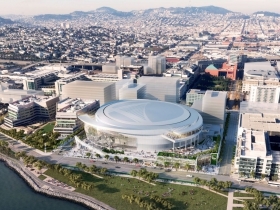 San Francisco Arena Rendering – Southwest Aerial. Design by MANICA Architecture. Typically, local and state governments are easily blackmailed into subsidizing pro sports teams. But the Bucks owners present a special situation, where government officials may have a much stronger hand to play. Indeed, whether you view the new arena deal as a business proposition or as a sort of charitable donation, the Milwaukee franchise is uniquely undeserving of a public subsidy. Begin with the fact that the Milwaukee Bucks have one of the wealthiest ownership groups in the plutocratic National Basketball Association. Of the 30 NBA teams, 13 had owners who were billionaires at the time the Bucks were purchased. The list compiled by Forbes was topped by Portland Trail Blazers owner Paul Allen, with an estimated net worth of nearly $16 billion. The Bucks’ owners would come in six or seventh place, about the same as Denver Nuggets owner Stan Kroenke (net worth $5.3 billion), but well ahead of Cleveland Cavaliers owner Dan Gilbert, whose net worth is a mere $3.9 billion. The Bucks ownership includes Marc Lasry, whose current net worth is $1.91 billion, according to Forbes; hedge fund titan Wesley Edens, whose net worth was estimated at $1.2 billion in 2008, but has declined to less than $1 billion since (he didn’t make the $1 billion cutoff for the most recent Forbes list of wealthiest Americans) and “substantial” minority owner Jamie Dinan (as the team described him), a hedge fund manager with York Capital Management in New York, whose net worth Forbes estimates at $2.4 billion. The three owners together are likely worth well in excess of $5 billion. Which stands in start contrast to the relative peons who own the Golden State Warriors, principal owners Joe Lacob and Peter Guber. Lacob, a partner with the venture capital firm of Kleiner Perkins Caulfield & Byers, has an estimated net worth of $325 million; and Guber is the CEO of Mandalay Entertainment, a multimedia company involved in film and TV, with a net worth estimated at $400 million. Yep, these two are among the least well-off NBA owners, yet they are building a new $600 million NBA arena in San Francisco with their own money. They are getting no public subsidy. This arena, as Don Walker reported for the Milwaukee Journal Sentinel, will seat 18,000 people. That’s exactly the same as what the Bucks want for their new arena. “Surrounding it will be 100,000 square feet of retail space; 3.2 acres of public space; and 580,000 square feet of office and lab space. 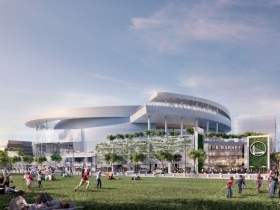 In all, 12 acres are being set aside for the entire development.” That, too, sounds similar to the Bucks’ plan, which would surround the arena with commercial (retail shops, bars, restaurants) development, parking and other development yet to be specified. 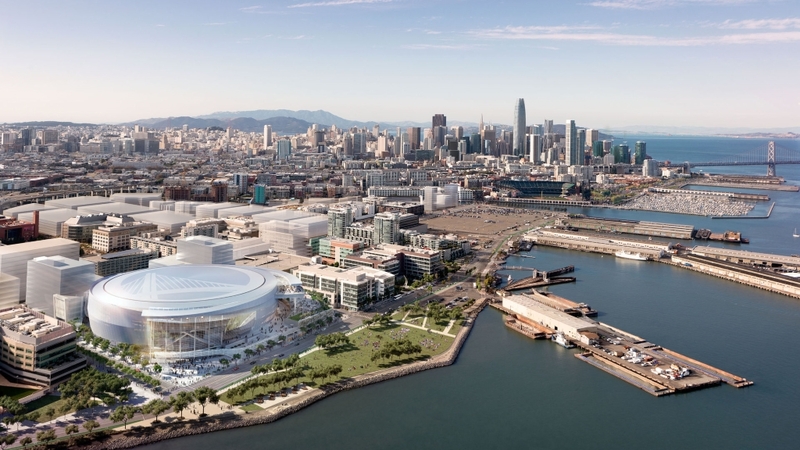 Sources say the Bucks owners want a total of 6-10 acres, which is not likely to include the 3.2 acres of public space in San Francisco, meaning the total footprint available for the development is pretty similar in both cities. 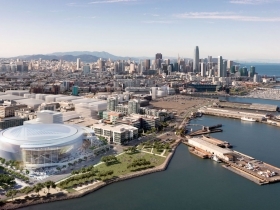 So if San Francisco’s owners are building their new arena without public money, why can’t Milwaukee’s? True, this is a smaller, less wealthy city, so the Bucks owners can’t charge as much for luxury suites, club seats and the like, which lowers potential annual revenue. The local TV contract in Milwaukee will also generate less revenue. So from a market perspective, Milwaukee is at a relative disadvantage. But the major problem with this argument is that pro sports teams don’t operate as a free market enterprise, but as a taxpayer-subsidized monopoly. The NBA runs the only pro basketball operation in America, whose teams get huge subsidies from the taxpayers. A study by University of Michigan professor Judith Grant Long found that, in recent years, the average public-private partnership has saddled cities with 78 percent of the cost and the teams with 22 percent. In 2010, she found, 121 professional sports facilities in the five major sports leagues required $43 billion in investments in new construction or major renovations. In essence, pro sports teams operate like public charities, that are typically awarded tax exemptions for their arenas and stadiums, and depend on donations from local and state taxpayers. In short, rather than evaluating a pro sports franchise’s subsidy based on principles of the free market, it makes more sense to analyze it as a charitable donation. Viewed this way, it might have been argued that original Milwaukee Brewers owner Bud Selig was more deserving of help than any other in Major League Baseball because he was the least well-to-do (or at least he was before two decades as commissioner made him very wealthy). By contrast, the Bucks owners are some of the richest people on the planet. Their combined net worth is seven times more than the $725 million combined net worth of the Golden State Warriors ownership. From a needs perspective, the Bucks owners are seven time less deserving of charity than the Golden State franchise, which got no help whatsoever. But even if you view this deal in cold-blooded business terms, the reality is that the Bucks owners are already making big money from the team, even while using that allegedly “outdated” Bradley Center. Lasry and Edens bought the team for $550 million, but the team’s value has already risen to $600 million, according to Forbes. That’s a nine percent increase in value in just nine months. True, the increase was exceptional, due to the remarkable $2 billion sales price for the Los Angeles Clippers. But it mostly reflected the value of the new TV contract signed by the NBA, which will increase long-term league revenue by $24 billion and give the Bucks an extra $89 million per year. The long-term prospect for the franchise is suggested by the return on Kohl’s investment: he purchased the team in 1985 for $18 million, meaning the $450 million sales price ($550 million minus the $100 million he contractually promised to donate to a new arena) gave him a magnificent, 25-fold return on his investment. Indeed, when you look at the Bucks owners situation, it becomes crystal clear: they can’t afford to not build the new arena, even if they don’t get a subsidy. The NBA has already made it clear it will take over the franchise and presumably award it to a new city if an NBA arena is not built here. The NBA has also indicated it would pay just $25 million more than what the Milwaukee owners paid or $575 million. But that decision was made before the new TV deal and prices the team’s value at $25 million less than its estimated current value. Sources close to the Bucks owners also say the team would be out many millions spent on planning the new arena. There’s no question the owners would lose a lot of money if the NBA took back the team. Not to mention that the Milwaukee Bucks are one of just 30 NBA teams on the planet, and Lasry, Edens and Dinan might never get another chance to own a team. The irony is that by holding a gun to the head of government officials in Wisconsin, the NBA has also aimed a bullet even more pointedly at the Bucks owners. If they fail to get an NBA arena built here, it seems unlikely the NBA would award them any other team in another city. They really have no choice but to build the arena. And there only a few people on the planet who could more easily afford to pay for it. Moreover, they will only get that $100 million from Kohl if they build an arena. Finally, even if the owners don’t get a tax subsidy, they will make a lot of money on this team as its value increases. All of which gives government officials a huge advantage in bargaining with the Bucks. Even if legislators turn down this proposed subsidy, Bucks owners have too many reasons not to pay for it themselves. –Robert J. Cook, vice-president of Bucks, has registered to lobby the legislature to approve funding of the new arena. -Blogger Neil deMause regularly covers the Bucks arena issue at his website, Field of Schemes, whose name broadcasts his punchy point of view. He has offered some amusing takedowns of the reporting by Walker; this is probably the best. -Back when Miller Park was built I reported that the deal was the most lucrative subsidy any baseball team had ever received (which Selig disputed). Prof. Long recently came to a similar conclusion: “The highest-cost deals [for taxpayers] include Indianapolis’s Lucas Oil Stadium, where the National Football League’s Colts play; Paul Brown Stadium in Cincinnati, home of the Bengals; and the Milwaukee Brewers’ Miller Park in baseball. In those cases, the public share of costs, once ongoing expenses are included, exceeds 100 percent of the building’s original price tag,” as Bloomberg reported. And it isn’t like Wesley Edens is a stranger to massive private investment in public-like things. His company, Fortress Investment Group (http://en.wikipedia.org/wiki/Fortress_Investment_Group), owns Florida East Coast Railway, which is privately building rail transportation in Florida (http://en.wikipedia.org/wiki/All_Aboard_Florida#Construction). The model there is similar, with the increased development of the surrounding station areas being the real prize. There is no “we” in “superstar.” In a league that’s focused on individuals and superstars (Lebron, Kobe,) but is dependent on fans and sponsors, it’s hard for any group of people to reach into their pockets and support “a team.” The days of “The Bucks” “The Celtics” “The Lakers” are long gone. Today it’s only about individual “stars” and if (insert your favorite NBA franchise here) doesn’t have one, or no commitment to get one, then you’re just a cog in the super star machine. Who’s going to pay millions for a “cog?” In the NFL “teams have stars.” In the NBA “teams work for stars” It’s all backwards – and that’s why it’s a bandwagon fan culture. Win we’re in. Lose… So what. Then of course… Milwaukee is so behind the curve… We have a goldmine of real estate that could turn this city into a thriving hotspot for locals, tourists and professional sports… Yet the lakefront is a dump (art museum excluded) and miller park sits between the edge of a freeway and a broken down community… Don’t get me started. So… If the NBA can rebrand itself and Milwaukee can grasp the opportunity the city offers (and then do something). We might be talking about an era where people and organizations pay to be here instead of asking for incentives to stay. Edens and Lasry don’t really have any local or state ties right? Is there any reason to believe they might not be all that upset if a new arena isn’t built by the 2017 deadline? They wouldn’t have any trouble moving the team to another city, possibly one with a more robust media market. I know they say otherwise publicly, but maybe they’re hoping to be able to move the franchise in 2 years. The only other market that would be a verticle move is Seattle. The rest are lateral moves. Plus, they live in NYC and that would be a 6 hour plane ride. Sometimes these things matter. I really believe they want to stay here otherwise why offer up another $50 million? The only one making money in this deal is the state. As the team and league increases payroll, they stand to rake in at least $15 to $20 million annually within 5 to 10 years. And arguably the city benefits from the venue, team and development that takes place as a result. The Brewers got a sweetheart deal- Bud mugged us. In my mind, this deal seems a bit more balanced. The city tifs out the area and improves infrastructure, the owners contribute 250-300M and the state bonds the increase in player income taxes, while leaving the current dollars in place. Seattle is not the only media market bigger than Milwaukee’s without an NBA team. And a smaller market, like Las Vegas, might be more attractive due to its tourism and proximity to Los Angeles, etc. Yes I know they’ve pledged a lot of money and what not, but that could be BS. 1. Since when is it custom to change pricing based on the wealth of those paying? So if the Bucks were purchased by less wealthy owners then we’d suddenly find the value in pitching in for this community asset? 2. Value of the team does not equal making money off the team. Just like owning a stock.. if the value has gone up you don’t realize that increased value until you sell. As you mentioned, they already have a set “sell” price if the arena is not built.. thus they cannot realize those gains. 3. Bruce you continually show how great Kohl’s investment in the Bucks was… but we already showed evidence that it wasn’t that amazing of a payoff during his time, especially considering all the money he put towards the team (and borrowed) during his ownership tenure. 4. The community has a real stake in this and will see many benefits. Least of these are additional development, tax receipts, use of a brand new facility for non-NBA events, and more. I think the current dollar figure put up by Kohl and the current owners is a good starting offer, but I don’t necessarily think they need to fund it 100% for this to be a net win for Milwaukee and Wisconsin. PMD, Lasry and Edens won’t be able to move the team. If the team is moved, they’ll be forced to sell and they’ll no longer be team owners. So the NBA owns the team if the new arena isn’t built by the deadline, not Lasry and Edens? That’s how it works? WSJ, NYT, Journal articles, many studies all show that building an Arena for these guys is losing proposition. Losing them is small black eye. To date no one has seen the contract between Bucks and NBA, as to what it says about them relocating, keeping the franchise here or if the NBA can grab franchise back and resell. All private money will be spent for the 1.4 billion stadium at LA. I can tell you that the legislature will not do anything till Milwaukee county, and city come up with big bucks. Out state the guys are universally opposed. Who wants to go to election time explaining to their voters how they voted 380 million for billionaires while cutting money from the schools. It will be miracle if they get much from state, especially after the dopy County board lied to everyone about Union contracts, spent millions on a racist attacks on David Clarke who is very popular in state, and the city spending 200 million or so on that trolley. PMD- close but not quite. Instead of NBA taking over, Lasry and Edens will be forced to sell to a new owner. WCD, your figures are all wrong. If you don’t believe me, google it. AG, Kohl earned a 25-fold return on his investment. By comparison, the S&P 500 grew 11-fold during that period, and as has been repeatedly proven, 99% of actively managed stock funds do more poorly than the market. You note that Kohl put in money to the Bucks, which I’m sure is true, just as it’s true he had profitable years. As no one has ever seen his financials there’s no way to know if he had more money losing years than profit-making years. As many sports economists have suggested, pro sports owners always get a good return from their investment. There may well be investments out there that would get a better return, but they probably involve more risks. And in any event, I’m not clear why it’s the taxpayers burden to assure that Kohl’s successor owners also get just as lucrative a return. I do know that the guv and many legislators felt that they really got hosed by Selig. Bruce, that’s a myth that the S&P outperforms the vast majority of managed funds. If anything, it would fall about in the middle of all funds. Herb Kohl’s additional investments are very important to the idea of him earning vast profit off the team… sure we can’t tell exactly how successful he was without the numbers on his investments/profits… but we can’t assume he made a ton either. Good investment? I’m sure it was… amazingly unbelievable? I’m not as convinced. Regardless, as much as you want to say that the public shouldn’t be paying to ensure the new owners get a profit… why too should two investors from NYC ensure that Milwaukee gets all the benefits a new Arena provides while the public bears no cost or risk? While I’m of the opinion that no taxpayer money should be ponied up for sports teams anywhere, I am ok with a contribution towards infrastructure. I don’t remember too many complaints towards Selig’s scam but I’ve never gone to a game in Miller Park because of it. I certainly don’t remember Scottie speaking out against it. And WCD, that is real chutzpah mentioning cutting money from schools. And what does High Sheriff David Clarke have to do with this discussion. The trolley has nothing to do with it either. That discussion is done and the project is going forward. Get on board or get out of the way. AG, in answer to your question, not clear why private business like Bucks should be treated differently than and other businesses. Bruce, I thought better of you than this. I hate this awful, lazy argument. I know that owning the Wave has made Sue Black rich beyond her wildest dreams, and who can deny that the owners of the Bonecrushers were pocketing millions when they couldn’t afford to pay their players, but aside from that this argument hinges heavily on a definition of “pro sports” that relies on the presumption of success. For every successful league, there are multiple unsuccessful leagues within the same sport. Refresh my memory, but what exactly did Milwaukee offer Kohl’s to try to lure the headquarters away from Menomonee Falls? What tax incentives were tossed around when Mercury Marines was considering moving jobs to Oklahoma? Yes, the costs for an arena is high, particularly when you add in that inconvenient bit about paying for roads to get to it (is that seriously not a consideration for other buildings in downtown Milwaukee? ), but let’s not pretend that sports teams are the only private businesses offered incentives by government. Kyle, I’m talking about Major League sports owners, not minor league, D league, soccer etc. And yes, the city and suburbs do routinely offer TIFs and the like. That’s far cry from what sports franchises get. Miller Park, when all is said and done, will cost taxpayers more than $1 billion. Bucks arena price tag has yet to be tallied but will be quite substantial. Ag, figures come right from Leg Ref bureau on loans plus interest and trolley will go over budget, figure losses from TIF, property taxes lost and interest this is huge loser. AG you do not have any idea what will happen as no one has seen the contract between Bucks and NBA, Money talks, BS walks. Closer to home, the Kohl’s deal was either $125 million or $145 million depending on whether the first number (usually quoted by the city: http://www.bizjournals.com/milwaukee/news/2012/02/15/kohls-hq-not-moving-downtown.html) includes the approximately $20 million dollars the County had on the table (http://www.bizjournals.com/milwaukee/blog/real_estate/2012/02/milwaukee-county-offered-more-than-20.html?page=all). Either way, that’s $25k to $29k per job. However, the Bucks deal would be in the neighborhood of $14.6 million per job using the full (and perhaps unlikely) $220 million assistance figure divided over the 15 player roster (http://en.wikipedia.org/wiki/Milwaukee_Bucks#Players). Even if you add in the roughly 130 people working at the headquarters, it is still $1.4 million per job. So, yes, AG, you’re correct, the state throws money at lots of things, but this is exorbitant. Especially when the benefit area is small and studies have shown that net entertainment dollars don’t change much because of this kind of thing. See http://www.psmag.com/business-economics/america-has-a-stadium-problem-62665 although that wasn’t the original article I remember reading that from. So what if we lose the Bucks, people who really love them will watch on their home TVs or over the internet and die-hard live sports people will go watch a different team or go to more movies or more restaurants. Their personal entertainment dollars aren’t changed by a new stadium other than maybe the initial season or two WOW factor of a nice shiny new building. Rich, if public financing was solely based on job creation, then a new arena would indeed be a terrible investment. But I don’t know that Kyle was specifically using job creation as a benchmark for public assistance. I think he was merely giving other examples. As far as the arena itself, the benefits are quite different than Mercury Marine or Kohl’s. My own personal view of the arena is more aligned with my view on the streetcar. Is it an absolute necessity? No. Will the city collapse without it? No, probably not. Will it help attract new people, companies, and create a better experience in our city by addition to the vibrancy and culture? Thus, through this and other projects we may be see more private investment and boost the local economy? I’m betting yes. Besides tax income from the Bucks, it’s a major marketing tool for our city, a recruitment tool for local companies, a pathway to resources for local charities, an opportunity for under privileged children in our city to experience something outside what they’re accustomed to, and much much more. I like the current Walker plan to use all or a portion of the increased tax revenue from the team to finance the public portion. This is money that doesn’t exist without them anyway and our community ultimately benefits more by helping the team stay here and having a new arena to boot. AG, that study was funded by Major League Baseball. No independent economist has found an economic spin-off from sports stadiums and arenas. AG, there are dozens of studies that prove what you are saying is BS. WSJ had one day or so ago. Stadium does help Milwaukee cause of people coming up from Ill. to see games. Wrigely field is dump. Walker plan is dead in the legislature. Unless Mil. cty comes up with big bucks and city of Milwaukee, there will not be any state help. Far too much opposition out state. A legislator out state is hardly going to back a stadium for 380 million state money over the period of loan and at the same time cut local school funding. Good way to get beat. People come from more than just IL for Brewer games, they come from all over the state as well. I think its fair to say that assumptioms for and against are made from both sides. However, two issues remain true; the Bucks are beneficial for Dt Milwaukee and they generate revenue for the state. Even if the state has to bond a portion of the income tax revenue for percentage of the arena. We can all agree that the income tax revenue of $10 million will go away if the Bucks leave. The indirect benefits are hard to calculate so I’ll leave them out. I believe we have heard all the closing arguments and now it’s time to decide. I move to strike WCDs comments as he has demonstrated strong anti-Milwaukee bias regarding every topic ever discussed on this site. AND he consistently puts politics above common sense…… and he’s mean. Baade, Robert AView Profile; Baumann, RobertView Profile; Matheson, Victor AView Profile. Southern Economic Journal74.3 (Jan 2008): 794-810. Walker, Matthew; Mondello, Michael JView Profile. International Journal of Sport Finance2.3 (Aug 2007): 149-160. Finally, WCD, that 2007 report boils down to this… no matter what the effect a sports team has… it’s not big enough to make a statistically significant impact on the metro area GDP. But I can make the same assumption about the level of public assistance. ie. the amount of public money spent on a new arena would be not be statistically significant thus really has no measurable negative effect on the city, metro, or state. Wasn’t it reported that taxpayers in the region pay $10 a year for Miller Park? Weighing that against the loss of the Brewers from Milwaukee, I don’t think too many people would be upset, especially considering the annual attendance at Miller Park when you factor in the size of the market. I guess I don’t care as much about a new Bucks arena due to my dislike of the NBA, but I certainly wouldn’t lose any sleep over $10 a year for a new Bucks arena. AG, you’re citing Robert Baade, Roger Noll and Andrew Zimbalist, all of whom take a dim view of alleged economic spin-off. Baade, who’s a Milwaukee native, even did a study of Milwaukee after Milwaukee Braves left and found no economic loss. BAH! I copied the against list! PMD, problem with $10 is all costs weren’t fully loaded. My calculation is about $1,585 per household over 30-year life of stadium for those living in the five-county area of southeastern Wisconsin. Of course stadiums have increasingly been getting replaced faster, so that figure would increase if Miller Park lasts shorter period and of course decrease if stadium lasts longer. $52 a year is still more than worth it to me. I love Miller Park and the Brewers and can’t imagine Milwaukee without them. I have no problem whatsoever paying $52 annually for the Brewers. OK, I’m going going through all that again… But PMD makes a good point, one that some critics (like Allen Sanderson) make… is that the individual expense to a tax payer is so minimal that it’s not irrational to support some level of public assistance for building a new stadium or arena. Bruce, that Milwaukee Mag article has a flawed methodology for calculating cost. They have almost $400 million in tax exemptions… but taxes that wouldn’t exist without the Brewers. It’s a false logic to call that a cost. Plus they include other things like lost charity expenditures to the community? That’s bizarre, especially since the Brewers are a funding mechanism for many charities. It also doesn’t take into account the net positive from the Brewers… ie income taxes, expenditures from people outside the metro, etc. The cost is not $52 per person per year. Divide 380 million , the cost with interest of the 220 million, by the number of people, 5.5 million and you get $70 each. They do not want to pay that, out state and the pressure is great. The Bucks do not have a big base of support. UW has 10 times that support. Worst is that it sets a precedent when ever any other city want to build an Arena, PAC, stadium, to want to do the same thing. Those of you that want to do it, chip in like we do with Packers and buy some stock. Or better yet form a caravan like Tommy did, and drive around state and talk it up. See what happens. AG, any tax break given to a company wouldn’t exist if the company wasn’t here. And the charitable loss was not included in total tax bill. Even economists who argue that new stadiums have no real economic benefit to a region state that it’s a different story when it comes to quality of life. Can that be quantified in any way? How much does quality of life factor into the build it or not build it debate? I agree with that statement Bruce, but it doesn’t change anything. In fact, isn’t that part of why we sometimes give businesses public assistance? What about revenue though, too? You can’t just say that taxpayers are on the hook for tax exemptions without looking at the tax revenue as well. Lets just say the average team salary over 30 years is $150 million. A top tax rate of 7% in WI over 30 years is over $300 million dollars in income tax from the players alone. Something tells me the 100 or so million left is more than made up for with sales taxes paid by fans from outside the metro both at the game and in the area. Typically tax breaks to businesses are computed in terms of jobs created, not taxes paid. Businesses (and individuals) pay taxes to support the wide range of state and local services they benefit from, this is not free money for the state. Bruce, let me make sure I have this straight. You’re saying that “individuals) pay taxes to support the wide range of state and local services they benefit from, this is not free money for the state.” So this must mean that you think government should better serve those who pay more in taxes. It’s not free money, so it should go to serve the payer. Based on his contract for this year, Braun should receive roughly 230 times the services from the state than the average household (actually more than that, but I’m not running the income brackets). Does it really cost that much more to serve Braun than it does to serve you? Or is there maybe, just maybe, enough left over to provide services for some of those who can’t contribute more? Good point. If the Bucks have a $80 million payroll and each visiting team pays income taxes, thats equivalent to 3,500 jobs at $25,000 per year. Can you imagine how much money Walker would throw at a company that promised to create that number of jobs. The reason this topic will never be honestly debated in that the vast majority of the Milwaukee Media and the powers that be (usually the people with their hands out as well) are all in on this project. The Business Journal is embarrassing itself with its TMZ-esque coverage of the Bucks owners. Steve Jagler just published a self congratulatory op-ed in the BizTimes regarding his support of public spending for not only the Bucks, but the Couture. 1) The new arena is being built so that the Bucks owners can create more amenities for rich people and also so they can capture more of the entertainment dollar, Why have someone grabbing dinner at Buck Bradley’s when you can eat at the arena. The rich guys are already at the games. Business Journal Icons with their hands out like Tan Lo and Mike Zimmerman are already in the house. 2) Yes, if the Bucks leave you lose that revenue, but this is discretionary income. Maybe people will go to more Marquette games. Maybe more Brewers games. Maybe they eat out more. In other words, people will find a way to spend the money. 3) Most of the really good development in our area has had very limited government financing. The resurgence of the 3rd Ward, the 5th Ward, the Tosa Village and Bay View was by and large done by business people taking risks. Bill you are right on. So the new arena is only for rich people? Are only rich people attending Bucks games? @Bill. I’m not rich and I love going to Buck’s games. There are always deals so the games are pretty affordable, even for families. Don’t believe the hype that NBA is just for the rich and corporate types. You’re waaay over generalizing. Furthermore, public / private relationships are leveraged in every city, in every county in every state. Just ask WCD about tif happy Wauwatosa. This ship has saled. TIFs are great development tools and not just for blighted areas. Cities borrow against increased property values to reinvest in infrastructure for the people. Also, take a closer look at the deals in Walker’s Point and the 3rd Ward. Historic tax credits, facade grants and small business loans have paved the way for development. Also, tifs have ensured that infrastructure is adequate for commerce, walkability and asthetics. AND historic tax credits are widely used in these areas to make the refurbashing of these properties viable. Your argument iss based in priciple, not reality. And please, take WCDs emdorsement of your opinion with a grain of salt. @Bill and David I’d add the Dwell in Bay View received tax credits, the Avalon Theater funding from MEDC, and the Bay View Colectivo used RACM bonding. And many of the developments in Walker’s Point and Fifth ward used tax credits as well. So yes local, state, and federal government programs have helped development in these neighborhoods. Not sure about Tosa, but much of the great development in Shorewood has used government tools to get it going as well. Oh yeah and then look at the Valley, if it wasn’t for the City of Milwaukee’s efforts it would still be essentially vacant. I should better explain. The amenities that they would like to add such as more boxes and cub seating are designed for rich people and not the usual guy going to the game. In other words, the upgrades that they want to make aren’t going to be geared at the people sitting in the 400 level. According to ESPN, attendance at last nights game (against a terrible team) was 12,500. Also, ESPN says the attendance Monday night was 12,200. Were there really more than 4,000 no-shows? Buck’s attendance is up over last year. I believe its at 14,700 per game. Also, FSN ratings for tv are up over 300%. That said, the less than great attendance is a result of 15 years of losing basketball. Brewer attendance was terrible during the late 80s and 90s. It’s amazing what a little hope can do – now they draw 3 million fans a year. AND a huge asset for the city, region and state. Furthermore, during the 70’s and early to mid 80s, the Bucks sold out every game. I believe the Bucks sold out over 100 straight games. We have a tradition here of supporting the Bucks and we are a basketball town and a pro sports town. Not many people here care much about the Badgers. Listen to sports talk and you’ll find that calls slow to a crawl when Badger basketball or football are discussed. Madison is a college sports town -Milwaukee is a pro sports town – outside of MU basketball, I could care less about college sports. WCD would disagree, but he’s wrong. The economics of pro sports is a little stupid at the moment, but I don’t want to lose our teams over principle. The financial plan is reasonable and consistent with other cities. In fact I believe its far more balanced than most. Most cities our size and bigger utilize far greater subsidies. Indy comes to mind. This is just politics. When sais and done, the owners will bring $300 million to the table, the city will provide millions in infrastructure improvements and the state will or should bond the increase in player income taxes above the current revenues to finance the remainder. Under the plan, the state will still collect the current levels of income tax revenue. They would only bond the projected increase in revenues. Milwaukee gains due to the 1,000,000 plus people that will come downtown for events at the new facility annually, the indirect benefits of keeping our region a pro basketball town, the state gains from the $10-20 Million they collect annually in income taxes that will ultimately help build roads and provide services in villages and towns in this state that could not afford to buld and maintain Main Street without SE Wisconsin. Key phrase, “Milwaukee gains” is what unsells it up north. If Milwaukee people want this so bad, pony up cause unless they do, no place to dribble. State gains from every business so you cannot expect the people out state to pony up with out several hundred million, should not have done the trolley, from County and city. Suggest you get all of the supporters and start a caravan around state and talk to those “Up nort” like Tommy did. Remember him telling them to “stick it to us”. Little regret there, dems screwed GOP and lost senate. Think that GOP dumb enuf to do that agin? If I were a dem running against a GOP up north that voted for this deal I would kill him: “millions for billionaires and pennies for the kids in school. I grew up “up north,” in De Pere, right outside Green Bay. At least once a year my family went to County Stadium for a Brewers game. The Brewers benefited us. They weren’t just Milwaukee’s team. WCD…. you said it yourself, “Up Nort” people are shortsighted, petty, lack perspective and facts. Straight from your mouth -you are a harbinger of misinformation and spin. They are your little pawns. What was the phrase Walker used?….. oh yeah divide and conquer. Divide with lies and emotion and conquer why turning the people against each other. It is the only way the conservative brand in this state can win an election. What and productive, positive and righteous slogan! It was so encouraging to hear that from our Gov. I knew there were bright days ahead for our state when I heard that. Divide and conquer sums up everything you stand for…. you don’t want them voting on merit and facts, you want to trick the little people. Get them angery… they’re not sure why but thy’re angry. Am I right WCD? I know you’ll probably respond in a twisted, weird and incoherent manner, but try and make it legible. When Bumbling Bob spews his elitist drivel, what he doesn’t realize is we are the people he pretends he’s trying to help. I didn’t grow up in Milwauke and we were lower middle class. It’s his family, with all the pharmacies and kids going to Ivy league schools and all his apartment buildings he likes to talk about and wave in our faces that benefits from us. It doesn’t seem as though you and your family suffered much in our progressive state.Please Bob, we don’t need the likes of you protecting us. We believe in honest, thoughtful dialog. We know you’re a political hack/ operative looking to twist and manipulate, which is clear by your lack of reason, logic and attention to detail. And you’re not the brightest. I have to throw that in there…. sorry. We need to refine and address issues in this state, I don’t deny that. But your dumb downed approach is just so uninspiring. Whoa David, lets not let this get too anti-conservative. There’s plenty of conservatives that see the value of the Bucks and the creative financing plan that’s been proposed. Just as there are leftists that oppose it. thnaks David, best laugh of the day. AG…. I agree. I know support and opposition for the plan comes from both sides. And I respect people opinions for and against. No disrespect intended. I just like to bust Bob’s chops every now and again. He’s a dopey antagonist, but he’s our dopey antagonist. It’s not uncommon for attendance figures to be inflated. Capacity is 18,000 and it was at best half full. When you can pull into a lot right across from the BC 5 minutes before the game and get a spot that doesn’t indicate a big crowd. Bucks send out PR gals and sell tickets for $5 all the time. Today’s attendance is only a snapshot. Let’s not be hasty. 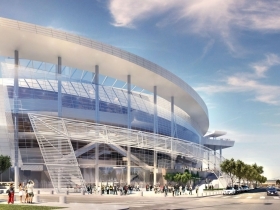 It looks like power-brokers will make sure a new arena somehow gets public money. I’ve only heard a few people–economists and Bruce M.–making the case that the public should then be getting a true share of the profit pie, like any other investor. That’s really the big issue. I could live with that, even though I’ve never been to a Bucks game (Brewers, yes). Why is that not part of the conversation? An MMAC task force wants a tax to support “cultural/entertainment organizations” capital needs (but noticeably not parks, unless some pollster says parks, after 30 years of defunding, deserve help with $200-$300 million in deferred capital needs). It’s no great leap to attach an arena to a culture/entertainment tax. So Bucks backers cut the line, muscle their way into a public subsidy and parks limp along with a little help from their park friends. Yes, all contribute to quality of life, but whose quality and whose life? Let’s insist on owning a slice of all that revenue a new arena will capture, including in all the spin-off ventures. But the hedge-funders will play hard ball and Milwaukee leaders will play along, desperately afraid of being jilted. Why are the Bucks even allowed to play in Wisconsin, much less get subsidies to do so, when the players are working (working?) with a collective bargaining agreement in place? Let’s fix that first with some legislation.